Disclosure: Transparency is important to us which is why you see this notice at the top of every page. Trendy Mom Reviews receives compensation for the posts on this site from brands or products. Our opinions are honest and our own. All Amazon links in our posts are Affiliate links. We are an Ambassador for these brands: Netflix, Cost Plus World Market, Best Buy, SeaWorld, and HP Moms. Visit the Trendy LEGOLAND® Discovery Center Dallas/Fort Worth for the Minifigure Birthday Bash! If you have a little LEGO lover in your family, they will be over-the-moon when they learn about the celebrations that LEGOLAND® Discovery Center Dallas/Fort Worth has planned for the 40th anniversary of the LEGO Minifigure! Let me share a little history. In 1978, LEGO® introduced its first Minifigure - the Police Officer - to its brick construction sets. Since then, LEGO has produced more than 1,000,000,000 Minifigures over the years. The LEGO Minifigures have been an iconic part of childhoods for many years! When: June 23–24 and June 30–July 1. The bricktastic birthday bash will be filled to the brim with all things Minifigures – even all 17 of the brand-new exclusive LEGO® Party Series Minifigures will be making an appearance. Junior division (ages 10 to 15) from 1 p.m. to 4 p.m.
Pre-registration is required by June 15, to sign-up visit here. *Activities are included in the price of admission. We hope that you have a chance to bond with your children at this trendy event! LEGOLAND® Discovery Center Dallas/Fort Worth opened at Grapevine Mills Mall in March 2011. 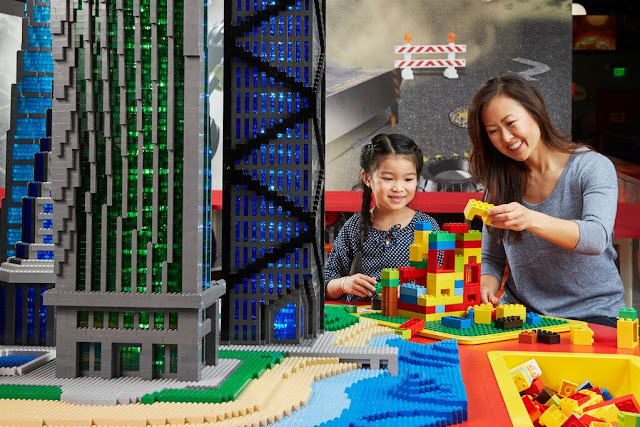 The 35,000-square-foot indoor attraction geared towards children ages 3 to 10 and their families, features millions of LEGO® bricks and offers a fun, highly interactive and educational two to three hour experience. Interactive features include hands-on play areas, a 4D cinema, LEGO® rides, outdoor water playground, special party rooms for birthdays and other celebrations, and signature MINILAND exhibit, featuring replicas of North Texas landmarks made out of LEGO® bricks. Admission is $21.95 for guests 3 years of age and older, free for kids 2 and under. Adults must be accompanied by children to enter. For more information visit dallasfw.legolanddiscoverycenter.com. Facebook/Twitter: @ldcdfw and Instagram: @ldcnorthamerica. Hours: Monday - Friday, 10 a.m. to 6 p.m.; Saturday, 10 a.m. to 8 p.m.; and Sunday, 11 a.m. to 6:30 p.m. - last admission two hours prior to closing. Tickets: Admission is $21 for guests 3 years of age and older, and free for kids 2 and under. Trendy Mom Reviews. Emails for this blog are only sent from the @trendymomreviews.com domain. Powered by Blogger.